Finally f-locking my lj and cleaning up the memories and the flist. mmmmmmm... who wants to blindfold them with me??? Hee! Can I braid Kevin's hair first? You're at the top of the list...well close to the top anyways. And yes - it is pretty. Pretty pretty boys! It's obvious that we have things and people in common, add me? Thanks! I wish I could take credit for it (banner) but I have yet to take the time to play and learn how to make my own. This one was thrown together by turlough for me in a response to a desperate plea I made. There just isn't enough 98* love represented in/on LJ. As for friending you? Done! I just wanted to let you know that I love love love your icon. *licks it right there*. I also love your fo banner and header image. We have a few friends in common and more than a few interests, as well. I have added you to my flist. And nice to meet you! 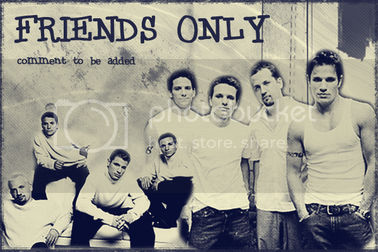 --->As for *NSYNC - other than JC - bleh. ---->You can read me over at bsb_playground where I play with my soulmatetwin jstabe. FYI - it's all slash. LOL! I have had this LJ for a little over 2 years. Where have you been? *giggles* Maybe you should get one and we could play together, although I don't play much in the AtS/BtvS fandom anymore. But it could still be fun. :) Done! Welcome to the chaos!!! LOVE the Supernatural icon- Winchester brothers are loooove! We seem to have several friends in common and also a LOT of interests in common. So, I friended you if that's okay. Friend me back? Seems we have a heck of alot in common, care to be friends? Welcome to my little world of kaotic insanity! *giggles* Actually, I don't post all that much...just the random meme or two. I'm really rather boring but feel free to pull up a chair and entertain me! *giggles some more* I might surprise you! hey. we seem to have a lot of things (and people) in common. add?